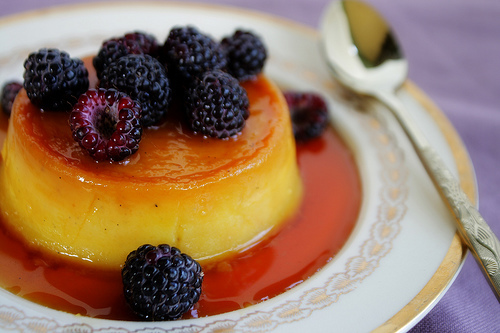 The flan, also known as crème caramel or caramel custard in some countries, is a tasty simple sweet dessert that may be served at fancy dinner parties as part of a variety for guests. It differs from plain custard because of its sugary base which becomes its topping when inverted. The recipe calls for 1 cup white sugar, 3 eggs, 1 can sweetened condensed milk, 1 can evaporated milk, and 1 tablespoon vanilla extract. Ahead of preparation preheat an oven to 350 degrees F.
Then in a medium saucepan over a medium low flame, melt sugar until it turns into liquid and golden in colour. Slowly and carefully pour the hot sugary syrup into a 9 inch round glass baking dish making sure to turn the dish to ensure that the sides and bottom are evenly coated. Place aside. In a large bowl, beat eggs; then beat in the condensed milk, evaporated milk, and vanilla until the mixture is smooth. Pour the egg mixture into the baking dish and cover with aluminum foil. Bake in the preheated oven for 60 minutes. When finished allow to cool completely. After the flan has been completely cooled and you are ready to serve, carefully invert the flan on a serving plate with edges.